Bring Us Your Glass ! Price includes text engraving on one side. Other options are available for an additional fee. Orders take two to three business days (Monday - Friday) to complete - this does not include shipping time, shipping time is one to five business days (Monday - Friday) after the order is completed. If there are any delays, we will contact you by e-mail. Over 100 different glasses. Dozens of fonts. Many stock designs. Custom logos, designs or artwork. No set-up fees. No minimum orders. Rush service is no charge (excluding shipping). Fast service. Best customer service on the web. Family owned with 3 generations and counting! Military customers receive a 10% discount with a valid .mil email address. Discount will be applied before we start your order. If you do not want any text (just an engraved design or logo) you can ignore the font selection. Character limit is a suggestion only, you can put more text on the glass, but it may be smaller to fit it all on. We automatically center your text,if you'd like a different alignment just let us know in the comments section. If you'd like to see a proof before we start your order just leave us a note in the 'Comments/Additional Information' section below. We're happy to work with you! Please note that requesting a proof may delay production time as we will wait for your approval of the proof before starting the order. If you don't want any text on the back of the glass, you can ignore this section. Adding text and/or a design to the back of this glass is $6.00 each. If you don't want a design, you can ignore this section. Free on front of glass!! Designs on the front of the glass are free. 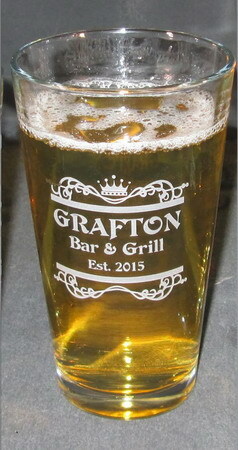 Add an additional $6.00 for a design and/or text on the back of the glass. If you have any additional information, special engraving instructions or questions, please note them above. Our shopping cart does not accept quotes (") or special characters such as accent marks in the text, if you wish quotes (") or special characters such as accent marks in the text, please let us know above. If we have any questions, we will contact you. If you need your glass in a hurry, please note in the box above the date that you need them and we will make every effort to get them out in time. If there is a problem, we will contact you as soon as possible. The 20 oz Beverage Glass is manufactured by Libbey. This glass may have minor bubbles or other small imperfections. This is normal and should not be seen as defective. etc... If you have multiple lines, do the same thing. Alternately, you can put 'as per email' in the text box and email your individual personalization instructions to orders@fantasyglassworks.com. Please use the same name on your email as on your order so we know which order is yours. Each individual personalized beverage glass page will have the number of lines and characters allowed below the picture. We do count spaces, but it is okay to go over, we're fairly flexible. Please keep in mind that the more text you want on a custom beverage glass the smaller it will all be. Our stock fonts can be seen on our Fonts page. We can use most Windows fonts - if the font you want is not on our list please feel free to email us with your request and we'll let you know if we have it. If we happen to not have it, you can email us the .ttf file. If you'd like to see a jpg proof of your text and/or design please leave us a note in the comments box and we'll send you one before starting your order. We will be happy to work with you on your personalization ideas. Please note that this is likely to slow production time as we'll wait to hear back from you before starting your engraved beverage glass. If you have any questions or concerns, please feel free to email us or give us a call or text at (815)964-2080. We're open Monday - Friday from 8:00 am to 4:00 pm Central Standard Time. We can put your logo/artwork on any glass. Please send us an Email with your design for our review. We will let you know if your design will definitely work. Your design must be black and white line art - no grayscale and no color. If your design is, for example, red and white then we can convert it to black and white for you. Please use at least 250 dpi. Formats accepted are: Bitmaps (.jpg, .bmp, .gif, .tif, etc...), Photoshop (.psd) and CorelDraw (.cdr, .cmx). We cannot accept artwork in Adobe Acrobat (.pdf) Microsoft Word or Microsoft PowerPoint formats. We DO NOT accept ZIP files, they will be deleted. If you're uncertain whether you meet these requirements, email us your design and we'll let you know. We do not charge a set-up fee. Have questions? Click here for additional ordering and engraving information or email us at info@fantasyglassworks.com with your question. A monogram is the three initials of a person's name with the last name initial in the middle and bigger - David Richard MacKay, for example, would be DMR. If you'd like to use the monogram style with the center letter (last name) larger than the others, please leave us a note in the comments box or text box that you want the monogram style and which letter is the last name. For example: DRM, monogram style, M is last name would be the best way to let us know what you'd like on your glass. Some people have four or more initials, Senior, Junior or a number included in their names - there aren't any hard and fast rules for doing these monograms so please let us know how you'd like it done or feel free to ask for assistance - we're here to help! If we see three letters entered without a note or instructions we'll assume you do NOT want the monogram style and will make the letters all the same size and in the ordered entered. Our discount schedule is based on dollar amount - this leaves you free to choose as many different types of glasses as you like and still receive the discount. We offer (for a small additional charge) over 175 designs that can be added, along with text, to our personalized glasses. Or you can get your company logo or custom design engraved, please see our Custom Design Instructions page for more information. Just for fun, here are various drink recipes grouped by main ingredient. Inspiration failing you? We offer various quotes that can be put on most glasses. Please email us at info@fantasyglassworks.com or call/text (815) 964-2080 8:00 am to 4:00 pm CST, Monday to Friday, for any question or comments about our engraving.